Win 1 of 25 Free Copies of the $571 Platinum Pack! If you haven’t seen the other videos in this series you should check them out now! 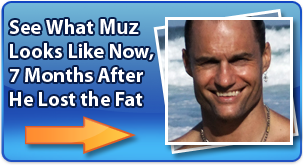 Good Day Muz, I am eager to learn your secrets in losing weight but I guess it’s too late already that I discovered your website. I’m 45 years old and overweight. I had a heart attacked 2 years ago and I am careful on what I eat nowadays. I tried some slimming pills, slimming coffee, slimming tea but to no avail. Due to my illness, I was advised by my doctor not to use weights that was too heavy. So I was still stuck to my overweight body. I saw your three videos and I was eager to win the contest to have the platinum pack as promised so that I can maximized my losing weight regimen. I was positive enough that your losing weight formula will really work for me since it doesn’t need more rigorous training exercises and I can still eat the food that I loved to eat. Wishing that through your generosity, you can still include me to have one of the most precious program in the internet today. Goodluck and more success in the future! I have been a full figured model in NYC for 20 years. I always had my career as an excuse to stay in the comfort zone of being overweight. My clients would literally drop me if I became to skinny. Now I am a single mom and a spokesperson on TV. I have a huge following as a face to the full-figured consumer and it is time to stop hiding my full potential and get healthy for me, my son, and as an example to other women. I am a voice with a platform and would like your help to convey a message-love your self enough to be all that you can be. I put myself in your hands to lead me, Muz. I’ve been trying to get in shape for years, but it’s always hard to get motivated. Your program seems simple enough that I think it would work for me. And, like the others, I’d be more than willing to tell others about it and refer them to your site! I think the 4 step formula will work for me because after watching your videos I’m convinced you know what you are talking about, not like other diet-gurus that have crazy programs which don’t work. I deserve a copy because I’ll use it to build a relationship with my mom while we lose weight together. You see I ran away from home when I was 15 because I didn’t like my mom’s boyfriend. I’m 28 now and want to part of her life again but after so long its difficult. We talked and I think doing this together will help us bond to be a loving mom and daughter again. Thank you very much Muz, we think you are awesome! my family has been getting heavier every year and it has to stop. Yesterday my youngest child, Claudia, came home from school crying because someone called her an ‘elephant’ and she is only 9. Her brother Lucas has all kinds of excuses for not going to gym but really I think he can’t keep up with the other boys because he’s too big and that embarrasses him. Every year my husband and I have to basically buy a new set of clothes because we out-grow our wardrobe. Dave has asked me to start buying him elastic waist jeans and trousers so he can ‘grow’ in comfort. Its insane we are letting ourselves get like this. Looking at us around the table and looking at the food we’re eating I feel sad. Please help my beautiful family to get on the right track before its too late! I trust you so much, after seeing your videos and seeing what you did with your own body. I really believe in the 4-Step Formula and in you. I think I deserve a free copy because I’ll use it to help 4 people, not just one. I think your 4-Step Formula will help me and anybody else who needs to lose weight because your great videos show that you really understand the issues of losing weight. I’m positive that the obesity epidemic can be directly linked to our growing insulin resistance, our excessive consumption of HFGS and our lack of effective exercise. All points which you’ve covered in your videos. Why do I deserve a free copy? Well I’m a really nice person so you have it in your power to really make my day! Does saying please help too? I think you already know by now that I’m a fan of yours. YOU did an amazing job with the free videos, I really enjoyed watching them (a few times, actually), and I’m following your tips blindly as they are just AWESOME! Therefore, I would love to be one of the lucky winners of this great program as recently I committed to start a brand new lifestyle, healthier and wealthier along with my new blog readers, who are young women, just like me, starting to get in the best shape. I truly believe that your book can change my life, as in teaching me what to eat, what NOT to eat and what kind of exercises to do. Even if I don’t get a copy of it, I’d absolutely love to continue promoting it, so could you please give me a version of the banners saved as gif instead of swf? I tried to reply to your emails but it seemed the email was not working. Feel free to cut this p.s. A litle off topic I know. Thanks a lot. I’ve been obese since I was about 19 years old. I’m a 41 year old mother of two (2) boys. I know if I don’t do something about it I’m going to die young. I know I am not teaching my children correctly, because I am obese & can not get out & play with them, please help. Your videos reallly gave me hope and they are the first thing in a long time that I actually believe would work for me. Please help me so that I can help my family. PLEASE!!! I believe that I should win your 4-step formula because I just made 18 and I want my last few months of high school to end with a smile. I have always been fat and miserable, and I just want to be able to have fun. I’ve tried programs, which resulted in an epic fail. I am constantly teased about my weight by strangers and my own family. They don’t know how it feels to go shopping and leave crying because there are only regular people’s clothes. Trust me, if you give me a free copy, I will succeed. I would love to win a copy of your system! I’ve been looking for something that didn’t include unhealthy diets, processed foods or diet aids, like pills and powders and that included a way to add muscle that I’ve lost due to atrophy. This may be just what I need! As a 47 year old female who is recovering from spine surgery, I have been sedentary for the past 4 months. My entire adult life has included a struggle with weight. I have Yo-Yo dieted for the past 25 years. Recently my cholesterol and blood pressure have elevated and I know that weight loss is essential for my general health. I am 5’4″ and weigh in at 190 lbs. My ideal weight is 128 lbs. It seems overwhelming to loose that amount on my own. The use of your plan gives me hope. Because of my surgery and lack of income because I cannot yet return to work I believe I am deserving of your offer of the 4-step formula. I saw your video and it looks like something that is good for me. The way my work is and I go to school I can’t really find the time to work out or eat rite. I go to acting school. I tried many diets and one diet I lost about 55 pounds but I end up gaining it all back. It was basically a tuna,tea,and veggie diet. I’m always on the move so I eat fast food a lot, but listening to your program if I can get me a nice routine goin like the one your program got I’m sure I can reach the ideal weight I wanna achieve. Also I have heart disease and diabetes that run in my family and I wanna stop this from happening to me before it even starts. And I believe with your help I can do this and be healthier than I ever been. Thank-you. I am an example of a so called “too busy working person” that has allowed my waistline to grow to a point of embarrassment. I know that if properly guided while following your 4-Step Formula, I would stay motivated and inspired, I could work the program and with its results, look and feel great. I would be a walking billboard, willing to tell anyone who asked how I got here. I feel like a represent 40-something folks out there that desire a healthy lifestyle but are too lazy or do not know how to lose and maintain their weight. My motivation is to be around living,to see my childrens’ children. I have tried several different commercial methods of weight loss to no avail. I am interested in your program because I need to lower my cholesterol and lose weight as I cannot take the statin drugs. I am also very interested in what your choices of foods would be, and I wish to use a healthy method of weight loss, which I believe your program encompasses. Looking forward to knowing more about your 4-step formula, and the secret source. I am a 41 year old male just like you but i don’t show how old i am, most people tell me i look much younger. I am going to the gym almost everyday but even though i am seeing some results i am not seeing the full results that i am looking for , like the defined body like you have. I am not working right now and money is tight for me right now, like almost everyone else. But soon i will be working as a nursing assistant and i want to be healthy and be able to do my job with 110% commitment and i think that if i had this program i know that will be able to have the energy and ability to do my job without me worrying about being burned out by the end of my shift. So if i won this program it would be the best thing that i could have to keep my body and mind healthy and strong to do everything in my life with the 110% commitment that i want to give in everything that i do. Thank you so much for giving this opportunity for 25 people to win your amazing program. Muz,my daughter is overweight. I want to start her on diet but I dont want her to get hungry. Saw your videos and the thing that caught my attention is that your even eating pizza! I think this program is PERFECT for my daughter and will make her healthier also because of the recipes that you showed in the video. I will be very grateful if I win. Thank in advance from me and my daughter Muz! but after 4 years eating america food I am too fat because america food is not healthy. it tastes good but not good for body. First of all, I just want to say that you look really good for a 41 year old man! I been following your videos for quite a while now and I have to tell you the truth that I all agreed to what you are saying on your videos. I been overweight for more than 10 years now, and I want to have that kind body also! I was hoping to WIN one of this but if not I’m pretty sure that I’ll buy one when it goes on sale. I’d like to try it first myself and see the result, if the result is good you can count on me that I will be spreading the word about 4-step formula! Thanks again Muz for this wonderful information. Muz, I am probably one of your oldest individuals who are deserving of this. I am a 58 year old coach and former personal trainer and I have two artificail knees as a result playing football. I trained people with your HIRT system and I am familiar with the basics of your nutritional philosophy. I give you more credibility as a result of my experience. This is a life style change,not just a resolution for the year. I am your man. I been struggling to loss my weight and have tried a lot of programs before, I even tried going to the gym and followed a program I did loss some weight but when I stop going to the gym my weight started to come back again! What I like about this program of your Muz is that you said you can even eat the food the you want! This kind of weight loss program I been looking for. I think it suite me well because Im also a busy man like you. I don’t have time to go to the gym anymore I’d like to test this and if it works, for sure I’ll will recommend it to my family & friends! I’ve been obese since I was about 11 years old. I’m 34 now and I know if I don’t dosomething about it I’m going to die young. I’m still single because I don’t like to intimate with guys because I’m embarrassed about my body. I was teased at grade school when we had swimming lessons and eveer since then I never let people see my body. it was ok when I was younger I didnt care but now all my friends have babies and husbands but I’m single, pleasehelp. your videos reallly gave me hope and they are the first things on weight I’ve seen in so long that I could actually believe would work for me. please help me, please, please, please!!! You are a good person, its easy to see from your voice and the things you write on your blog. I totally believe that you totally believe in the things you teach. Plus, any intelligent person can see those things are well thought out and not scams or gimmicks. If I was going t get just one book this year to live a more healthy life this would be it because I think its going to be an amazingly helpful for me, my family and so many other people. I don’t deserve to win, I’m sure there are many more deserving than me. I would love to win, I had back surgery this summer and couldn’t do much while recuperating. So I gained weight, I have a big muffin top and can’t seem to loose much weight. I don’t want to wear any of my tight clothes, because it shows off my roll and I hate it. I would love to know what to do. Help!! Thanks . i LOVED your videos, wow! they were amazing and free! i learnt so much frm them that I cant wait to get a copy of the 4-step formula because I know this will be the program that finally works. all the other programs seem to be based on tricks or crazy stuff but watching your videos is like going to a medical lecture because they’re so clear and well done! I only want to lose 10lbs so I can fit in my wedding dress. I dont know if that makes me selfish because there are lots of people that need help more than me but my fiance and I hav spent just aout every cent we have on a beautiful wedding but if I don’t lose 10lbs in the next 3 weeks I’m going to have ugly back fat bulges. Please help! my dad and my uncle both died of a heart attack before they were 50 and now I can see my brother heading the same way. He so wants to get thinner but our family is not healthy and we have no idea how to do it. Watching your videos has been amazing. We’ve learned more from the 3 secret videos than we have in … well, ever. I know the 4-Step Formula can put my bother on the path to outliving our dad and much older. Hi Muz, I’m fat and my wife doens’t find me attractive anymore. I want to rekindle the passion in my marriage by getting a six-pack that she can’t resist. I know it can be done and after watching your videos I’m convinced it will work for me too. I can tell you are honest and really believe in what you teach. That makes me really confident that the 4-Step Formula will work for me too! I deserve a copy because I’ve been watching all your videos and see we are totally on the same wavelength. I’m a busy single mum and I’ve tried everything to lose 15lbs of ugly fat I’ve never lost after my last girl was born. Raising a family on my own is tuff and I don’t have the time to work a fulltime job so things like your book, which I’d love to have, I usually have to pass up because the needs of my kids come first. A free copy would give me the chance I need to do something for me! I deserve to win a copy of your 4-Step Formula because I believe I would be a good ambassador for your product as I have a very busy lifestyle BUT am also very lazy as well. I need something that is easy and that keeps me interested while still having fun, I have read your previous steps and I am still interested – to me thats the first step for me to transform my lifestyle to a healthy lifestyle, one that will make me much happier and nicer person to live with – that is all good. When I find something thats good, easily accessible and very worthwhile – I tell everyone. I deserve to win a copy of your 4-Step Formula because I believe I would be a good ambassador for your product as I have a very busy lifestyle BUT am also very lazy. I need something that is easy and that keeps me interested while still having fun, I have read your previous steps and I am still interested – to me thats the first step for me to transform my lifestyle to a healthy lifestyle, one that will make me much happier and nicer person to live with – that is all good. Remember to include your email address so I can contact you if you win.